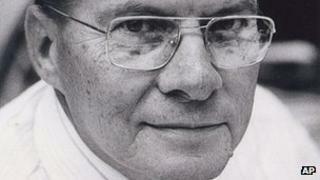 The inventor of the television remote control has died at the age of 96, his former employer has said. His invention was a luxury add-on in the days before hundreds of cable television channels. Born in Chicago in 1915, Polley began his engineering career in 1935. He worked at Zenith for 47 years, earning 18 US patents. He was a long-time resident of Lombard, Illinois, outside Chicago. Because the Flash-Matic used light to operate the television, it was temperamental and other lights could interfere with its operation. It was followed by sonic-controlled remotes and then infrared and radio frequency models. Before Polley's invention, Zenith's first remote was connected to the television by a wire cord. Polley was proud of his invention, Zenith spokesman John Taylor told the Associated Press, showing off the Flash-Matic to visitors after his retirement. "He was a proud owner of a flat-screen TV and modern remote," Mr Taylor added. "He always kept his original remote control with him." Along with another Zenith engineer, Robert Adler, Polley was honoured in 1997 with an Emmy for his work.